All of his life Frederic Lyman has been passionate about exploring the outdoors and giving back to nature and the environment through volunteer work and other philanthropic activities. Frederic Lyman grew up in the small town of Ashby, MA, where his grandfather bought houses in the same neighborhood as his for Frederic’s father and aunt. His goal was to keep the family connected and because of this Frederic Lyman grew a strong attachment to his community. As a philanthropist he helped to build a library in his hometown. Frederic Lyman has always had a passion for the outdoors. In his youth he spent a total of eleven summers camping in Maine, five of which he worked as a counselor leading 8 week wilderness trips. During his summers spent in Maine, Frederic Lyman became infatuated with exploring nature and admiring the world around him. 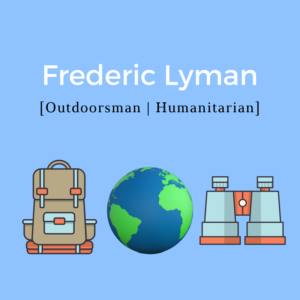 Years later, Frederic’s hobbies of hiking, fishing, camping, rock climbing, and skiing have all stemmed from this passion for exploring the outdoors. When Frederic and his family travel, he is always sure to plan a hike to explore the natural beauty of the world and unique environment, no matter the destination. These passions have driven Frederic Lyman to want to give back to nature, which has given him so much enjoyment in life. He has done this by becoming a member of the American Hiking Society, creating a water.org fundraiser, and donating to the Habitat for Humanity Hawaii Island GoFundMe created by ST. Louis Cardinal Kolten Wong.